Mountmellick town can be traced back to 1440 when it became a garrison town for the soldiers of Henry V1 when defending the Pale from the pressures of the Irish Chieftains. In 1655, Quakers otherwise known as the “Society of Friends” formed in Mountmellick which became the most important Quaker centre outside Dublin. In 1655, the group were joined by William and John Edmundson, Richard Jackson, John Thomson and John Pim, starting with a population of 175 equally divided between Irish and English. Under the astute leadership and simulation of William Edmundson, Mountmellick advanced more successfully than any other provincial town and due to its dynamic industrial development became referred to the as The Manchester of Ireland. Quakes are greatly misunderstood in Ireland due to their perceived association and as planters from England. However, history would show that Quakers were as much victims of the crown as the indigenous population. As religious dissenters of the Church Of England, they were targets like the Seperates and the Puritans. However, Quakers were devout pacifists and refused to fight in England’s wars or pay taxes if they believed that their proceeds would assist a military venture in any way. They believed in total equality and would not bow to nobility or take oaths of allegiance. Women achieved greater equality in the Quaker society as they were allowed to participate fully in Quaker meetings. The Quakers believed in a simple life and this belief carried through to their burial place which are presented as simple but poignant reminders of the person and their family which may also be buried in the family grave. 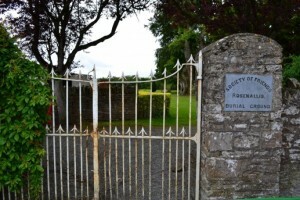 The society of Friends graveyard is sited outside Mountmellick and Roseanallis and is now recorded as a protected structure. Dating from 1725 to the present day. It is marked on the 1841 OS map as “Quakers Burial Ground” and on the 1908 OS map as “Friends burial ground” local name Friends burial ground. However, the majority decided to leave Ireland during the famine period and emigrated. Of all the Quaker families that immigrated to the new world, almost three quarters of the male heads of households had spent time in an English jail. Nickolas Newlin born abt 1630 in Hampshire, England, obtained permission from the Mountmellick meeting house in 1682 to immigrate with his family to the new world. His reasons for immigration cited concerns about the persecution of the Quakers in Ireland. This is one example. Now, the descendents of the original Quakers number in their thousands. If you wish to trace your family in Mountmellick, we will provide local assistance during you visit.